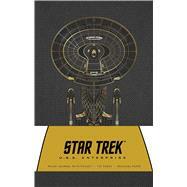 Celebrate the legacy of Star Trek with this deluxe journal featuring the iconic U.S.S. Enterprise. Boldly go where no one has gone before with this deluxe journal celebrating Star Trek through the years. Featuring images of the iconic U.S.S. Enterprise starships, this journal gives fans a chance to update the captain's log, track planet coordinates, and document their adventures through time and space. Live long and prosper. With sturdy construction and sewn binding, this journal lies flat, and the 192 blank, acid-free pages of high-quality heavy stock paper take both pen and pencil nicely to invite a flow of inspiration. Includes a ribbon placeholder, elastic closure, and 6.5 x 9.75–inch back pocket, perfect for holding photographs and mementos.